When sizing a weathervane it is important to keep in mind the average viewing distance between you and your new weathervane. 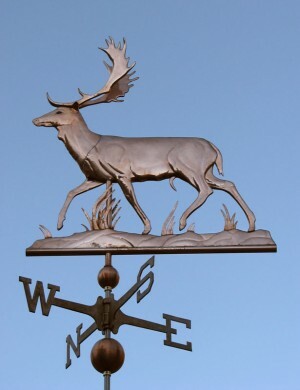 If you will be viewing your weathervane from closeup, it can be smaller than if you are viewing it from farther away or on top of a large structure. After making weathervanes for over 25 years, we can assure you it is easier to mistakenly get a weathervane too small for a structure than it is to get it too large. 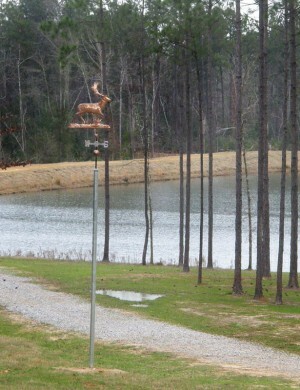 When you are standing right next to a 3 or 4 foot weathervane sculpture piece, it looks huge. However, when mounted atop a 3000 sq. foot plus structure or viewing it from a distance, it scales down considerably.